Last night, I had the opportunity to join 20 other people at a "wine" pairing dinner at the Lake Arrowhead Resort. We had the private "Magnum Room", at Bin 189 (thanks Dayna Czermak). This was a five course meal paired with three Remy Martin Cognacs and two sparkling wines. I'll go into the menu and my thoughts on the pairing in due time, but I thought it might be worthwhile to take a very basic look at what makes Cognac...Cognac. The saying goes, "All Cognac is Brandy, but not all Brandy is Cognac". So what is Cognac, and what makes it special? Cognac is a vine growing region in France, just north of Bordeaux. Cognac is a brandy, that is to say, it is a distilled spirit made from wine. Within the Cognac region, there are six growing districts. The two best are Grande Champagne, and Petite Champagne. These districts have nothing to do with the Champagne region known for sparkling wines, other than they share the same light chalky soil (Santonian and Campanian chalks). The grapes used to make wine are Ugni Blanc (probably better known to Italian wine drinkers as Trebbiano), a small amount of Colombard, and an even smaller amount of Folle Blanche. Once the high acid, generally undrinkable still wine is made, it is then distilled in pot stills, known as Cherentais. Distillation basically boils the wine, and separates the alcohol, water and volatile substances. In the case of Cognac, it is distilled twice, to get a purer product. Next, the distilled brandy is stored in oak barrels for a minimum of 30 months. When the brandy is ready, it is blended with other brandies from different vintages, to create the house brand. Just before bottling, the alcohol strength is cut down with distilled water to bring the total alcohol level to 40%. Cognac brandy is measured based on the youngest spirit in the blend. VS (Very Special) is a minimum of 3 years old; VSOP (Very Special Old Pale) is a minimum of 4 years old; and XO is a minimum of 6 years old. Remy Martin Cognac shows "Fine Champagne" on the label which indicates that the grapes used were from a blend of grapes from the two best regions. Remy Martin was founded in 1724, and is one of the oldest Cognac producers. Their labels feature a Centaur. I have tried to determine the significance of this symbol, and the best explanation I have heard is that it represents the cross between man and nature (and also the founder might have been a Sagittarius). The 1738 is a proprietary blend for Remy Martin, and honors King Henry XV and his decree, allowing Remy Martin to expand their vineyards in 1738. 1st Course - Baked brie w/ apple butter, prosciutto and caramelized pear - matched with Piper Heidsick Cuvee Sublime. I found this Champagne to have nice toast and pear characteristics, and some good acidity. It was a demi-sec (having some residual sugar). The acidity worked with the creaminess of the brie, and the little bit of sweetness went with the salty prosciutto. 2nd Course - Roast duckling w/ sweet & sour shallot sauce atop baby green - matched with Remy Martin VSOP on ice. The VSOP on ice was an interesting approach. I wouldn't normally put Cognac on ice, but it did mellow the "heat" from the 40% alcohol. The Cognac had characteristics of nuts, citrus and vanilla, which kind of worked with this dish. By mellowing the Cognac with ice, it did pair up with the sauce on the duck, but not my favorite pairing. Both were nice on their own however. 3rd Course - Parmesan potato croquette w/ champagne sage and mushroom ragu - matched with Domaine Carneros La Reve Blanc de Blanc. My favorite pairing of the night...this one really worked! The sparkling wine from Carnernos (La Reve means "the dream"), had notes of yogurt, pear and yeast. The creaminess of this dish worked with the acidity of the wine. The earthiness of the mushrooms and saltiness of the Parmesan were a wonderful pairing. 4th Course - Pork tenderloin w/ a glazed honey sauce and sweet cous cous - matched with Remy Martin 1738. This Cognac seemed a bit "hot" to me, even though it had the same alcohol level as the other Cognacs of the night. Once again, strong vanilla, nut, and citrus characteristics, with a hint of butterscotch and dried fruit. I found myself cutting the Cognac with a bit of water to reduce the affects of alcohol. The sauce reminded me of kumquats, but there wasn't any in there. We were told it was a blend of honey, orange juice, and soy sauce. Whatever it was...it worked. The cous cous had stewed raisins, but was a little too sweet. 5th Course - Vanilla Creme Brulee w/ caramelized apricot glaze and whit chocolate Grand Marnier Truffle - matched with Remy Martin XO. To me, this was the smoothest of the three Cognacs. The same characteristics of the others, but with this dish, the vanilla just popped out. I could have done without the white chocolate truffle, as the Grand Marnier had faded to nothing by the time it was plated. All in all, and very nice evening to explore Cognac with a main course. I have now found some new pairing ideas for future meals, and learned a little more about the uniqueness of Cognac, and Remy Martin. I'd love to hear your pairing ideas! 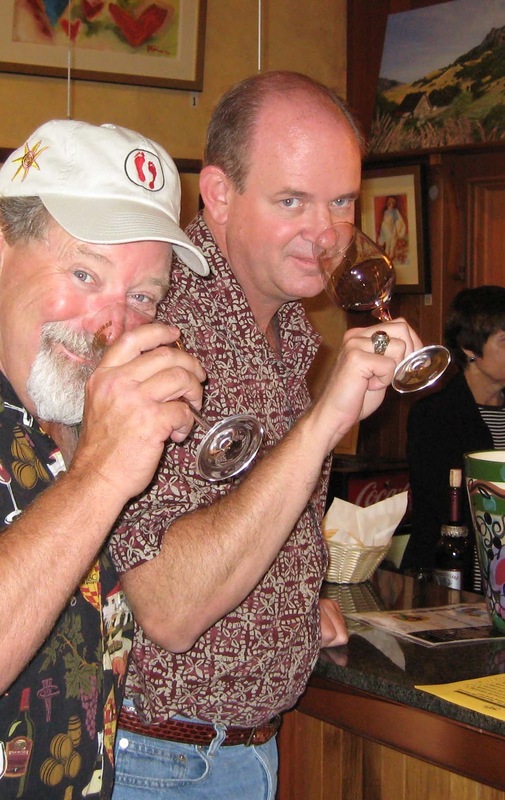 Are you a wine "taster" or a wine "drinker"? If you have been following this series of blog posts, you are well on your way to becoming a wine "taster" and an enthusiast. In my first post in this series, we discussed appearance. In the second post, we looked at all the components to evaluate in the "nose" or smell of the wine. And, in my last post, we looked at taste or palate. Now we need to put it all together and come to some type of conclusion. Let's start at the end...what conclusion are you looking for? For me, I try to determine if this is a wine I like; if it is a wine that I can store; if I can pair it with certain foods; and if it is a good value. The previous three steps have led you to this point. Now we will put it all together. We'll take a look at balance, length, intensity, complexity, and expressiveness. In step three of our tasting, we recorded a number of different aspects of the wines' affect on our palate. Balance in a wine refers to alcohol, acidity, tannins, sweetness, flavor, and how they all play together. These five components make up the "structure" of the wine. The goal is to have a wine that isn't overpowered by one component. If a wine is high in acid or tannins, but is missing fruit characteristics, the wine probably will not improve, and just taste "off". This would be an unbalanced wine. Some wines will taste "hot" from excess alcohol, this is a component that will not change with time. So, look at all components, and determine if they are balanced, and compliment each other. We've already evaluated the finish or length in step three. Review your notes, as length is a sign of quality. Again, we looked at intensity in our previous three steps. We looked at intensity in color/appearance, aroma/bouquet, and flavor. Are all three low, medium, high, or a mix? What is your overall impression of all three evaluations combined? The definition of complexity is "something with many parts in intricate arrangement". It is the combination of body, flavor, intensity, balance, and finesse. If you ever want to compliment a winemaker....tell him/her that their wine has great complexity. This is what keeps you coming back for more. Sticking your nose in, and smelling and sipping over and over again. The last evaluation really does take a lot of tasting. You need to know what is "normally" expressed for a certain variety. If you are tasting Cabernet Sauvignon, is it what you would expect from a Cabernet Sauvignon? You could even get more specific....does that Cab taste like a typical Rutherford cab, or a typical Margeaux? The only way to know, is to taste a lot. Add it all together now, and come to your own conclusions. Is this a quality wine? Would you buy it? How much would you pay for it? Is it ready to drink, or should you hold it? Remember, this is your evaluation. The most important point in tasting is to find a wine that you enjoy drinking, and will keep coming back to. In my first post in the series, we discussed what to look at when you are wine tasting. For some reason, this post ended up showing up after post number three, but is actually the second step in tasting. These visual clues should set you up for what is about to happen next. It is very easy to describe what you see to another person, but when it comes to smell, things get a little more complicated. If you are like me, sit there and smell a glass of wine for long periods of time, trying to pick out all the different aromas that come out of the glass. Nosing (or smelling) a glass of wine is one of the best parts of wine "tasting". Smelling a wine is critical in tasting a wine (ever try tasting a wine with your nose plugged? It probably didn't taste like much). So, how should you go about nosing a glass of wine? Well, first off, make sure the glass isn't too full, or you might end up spilling wine all over, as this step in tasting requires swirling the wine in the glass, to spread the wine around the inside of the glass, and open up the wine for smelling. Next, get your nose down in that glass. Don't just take a little whiff, really get in there, and take a number of quick sniffs, to maximize your impressions of the wines aroma. Don't stay in there too long, as the alcohol in the wine will fatigue your nasal cavity in a short period of time. This means you'll need to evaluate in a short period of time, and smells are one of the hardest things to remember, and describe. Try describing the smell of a green apple, or a plum. Since smells are so hard to remember, it works best to have a list of aromas that you can run through your mind. As you go through each aroma on your mental list, you can try to pick out that aroma in the wine, or eliminate it altogether. When describing a wine, we often refer to aroma and bouquet. To a sommelier, these are two different things. Aroma generally refers to primary fruit aromas, found in younger wines, while bouquet refers to secondary smells attributed to age and maturity that have occurred in the bottle. Bouquet is typically more complex than aroma, made up of many different scents. So now that you have some descriptors to work with, let's put this together for your tasting. First, nose the wine, and determine if you are getting "clean" smells - making sure the wine is not faulty (corked, oxidized, etc). Next, is the aroma or bouquet intense, or fairly mild? Is the wine showing primary fruit, or more complex bouquet? What in your list can you pull out of the glass of wine? Your descriptions will help you remember the wine. and can help you share the experience with others. It can also help you in your full evaluation of the wine. Remember to record what YOU smell, not what someone tells you you should smell. If the wine label says your cabernet has notes of cassis, or black currant, but you only smell blackberry, write down blackberry. In the beginning, you might only smell dark fruit...don't worry, your descriptors will grow with practice. One of the common questions I get is, "how can I develop my sense of smell?" The answer may seem obvious, but "smell everything, and try to record that smell in your memory". Taste a lot of wine, and record your observations. Last is an exercise I have done with small groups....take a bunch of glasses, and fill them with the same amount of base wine (usually an inexpensive box wine). To each glass, add a fragrance. I've used cooking extracts, leather, tobacco, etc. Cover the glasses with plastic wrap, to hold the fragrance in. Number each glass, and record what is in each glass with a recap list. Then create list of possible scents, and see if you can match the scent in the glass, with a scent on the list....lastly, check your answers, with the recap list you had created. Over time, you will be able to identify those scents in the glass. It takes practice, and concentration. There is a good tool available called the Wine Aroma Wheel, by A.C. Noble. Next week, we'll take a look at taste, or how the wine "plays" on your palate. Remember, have fun with your wine, and drink what you enjoy! In our previous two blogs, we evaluated the appearance of the wine in our glass, and stuck our nose down in there. We should have some idea of what to expect when we finally get some wine in our mouth....but not so fast! Now comes the portion of our examination that takes quick evaluation, great concentration, good memory, slurping, sucking and spitting.. Remember your elementary school classes about the senses? When it comes to taste, we sense sweet, salt, sour, bitter. We don't typically worry about salt when tasting wine, but it does show up in certain wines produced near the sea, so for now, let's just focus on the other three. Take a small sip of wine, and notice how it affect the tip of your tongue (this is where you sense sweetness). See diagram to the right. Since sweetness is the first thing you sense, it is the first taste we evaluate. Is the wine sweet, dry, or somewhere in between? Be sure not to confuse "fruitiness" with "sweetness", as wine can be fruity but dry. Sweetness is determined by the residual sugar in the wine. If you are not sure, just stick the tip of your tongue in the glass. It may look a bit odd to others, but it will confirm your evaluation. Next is to determine the acidity (sour) of the wine. This is sensed on the sides of the tongue and is felt by the mouth-watering affect the wine has.This can be evaluated as low to high, or some where in between. Want some help in determining the difference between low and high? Try a low acid Gewurztraminer versus a high acid Riesling....I think you'll notice the difference. Now swirl the wine around in your mouth. "Chew" it, and get it on your teeth and gums. If you get an astringent feeling, this is tannins. You won't typically sense this in white wines, as tannins are from the grape skins, stems, pips, and also from barrels. Again, these can be non-existent, or low to high. Where acid was mouth watering, tannins are mouth drying. If you are still not sure how tannins affect you, try tasting a styptic pencil (found at your local pharmacy). Next, evaluate the "body" of the wine. Is it light (like skim milk), or heavy (like cream), or some where in between (2% or whole milk). This can be affected by alcohol, sugar, tannins, and the fruit itself. When you swallow the wine, you can sense alcohol in the back of your throat. If it is balanced, you won't get much "heat", but if it is not balanced with the acidity, then you might get a sense of heat. This evaluation should confirm what you saw in our appearance check (legs or tears are signs of alcohol and/or residual sugar). What is the intensity of the wine in your mouth? Are you getting all types of flavors, or is there barely anything there? This can be rated from light, to medium, all the way up to pronounced. The best way I find to get a good sense of intensity (and the next step: flavor characteristics) is to slurp my wine. I draw a small amount of air through my lips and gurgle the wine in my mouth. As I draw air in my mouth, I release it through my nose to try and get as much of the wine aroma into my nasal passages. Remember, the majority of taste is actually smell. Try plugging your nose while tasting your favorite food, if you don't believe me. So, what do you taste? What are the flavor characteristics? Rather than going over the list again, take a look back at our last post about nose, and see the common descriptors we provided. In the beginning, these might be basic characteristics that you can determine, but with practice, you'll get more specific. There is one last evaluation for taste, and that has to do with bubbles (or mousse). This is pretty obvious on sparkling wines, but you may encounter bubbles in wines due to secondary fermentation in the bottle (a fault in still wines), or a slight fizz in some wines, like Vinho Verde. If it is a sparkling wine, are they gentle bubbles or aggressive? Do they last, or fade? These can be indications of quality. Before recording your tasting notes, make sure you sip your wine, swirl, gurgle, and spit. Wait for the finish. Savor the experience....now you can take notes. If you've followed the last two blogs, plus this one, you should now have a good basis for evaluating a wine. In our final blog of this series, we will put it all together to come up with conclusions about the wine we have in our glass. Oh...and not to over-emphasize....when tasting (versus drinking) remember to spit the wine out. If you keep on swallowing, your senses will be dulled, and evaluation will mean nothing. This is one of the biggest differences between tasting and drinking.